**The Advisor has contractually agreed to reduce its fees and/or pay Fund expenses until at least July 31, 2019. Performance data quoted represents past performance and does not guarantee future results. The investment return and principal value of an investment will fluctuate so that an investor’s share, when redeemed, may be worth more or less than their original cost. Current performance of the funds may be lower or higher than the performance quoted. Performance data current to the most recent month end may be obtained by calling 866-811-0224. The funds impose a 1.00% redemption fee on shares held for thirty days or less. Performance data quoted does not reflect the redemption fee. If reflected, total returns would be reduced. The final quarter of calendar 2018 proved treacherous for most capital markets around the world and was an especially difficult period for the Hodges Funds, which experienced trailing relative performance. Although every major stock market correction seems unique in its own way, the market decline that occurred in the fourth quarter of 2018 seemed particularly unusual as the forces driving strong fundamentals seemed disconnected with U.S. stock prices. While 2018 was marked by uncertainty surrounding international trade tensions and higher interest rates, U.S. economic growth during the year was solid as was earnings growth among U.S. corporations. Despite the long-anticipated process of the Fed normalizing interest rates and international trade disruptions during the year, earnings growth for the S&P 500 index is now estimated by FactSet to top 10% in the fourth quarter of 2018, which would mark the fifth straight quarter of double-digit earnings growth. Growth over the past year has largely been a function of tax reform stimulus, and a generally strong domestic economy. More importantly, we see the current economic backdrop for earnings growth among many U.S. corporations as favorable for the year ahead. Equity valuations seem reasonable with the S&P 500 ending the year trading at 15.1X forward earnings estimates according to FactSet compared to a five-year average of 16.4X. The inverse of the current PE multiple is an earnings yield of 6.6%, compared to the 10-year treasury yield of 2.69% at the end of the year. This relationship has widened over the past three months, which we believe indicates that the potential reward for holding stocks outweighs the underlying downside risk. As a result, the investment team at Hodges Capital Management spent a good deal of 2018 positioning our portfolios to benefit from broader economic growth and earnings improvement across a wide number of sectors. So, if the fundamental backdrop has not changed, why did U.S. stocks, as measured by the S&P 500 index, decline by 13.5% in the recent quarter to finish the year down, and why are many of the most economically sensitive stocks down more than 20-30% in recent months? We believe the most apparent answer is that the market is pricing in a recession or at the very least a significant slowdown in the U.S. economy. The reality is at some point every strong economy and business cycle experiences an eventual slow down, just as every bear market in history has been followed by a bull market. The big question heading into 2019 is “How much is already priced into individual stock prices?” While the severity of any downturn is hard to predict, we believe a conventional slowdown in economic activity (versus a 2008-2009 financial crisis) is largely priced into many stocks. Although the fear of the unknown is often far worse than the reality causing equity markets to historically overact ahead of a slowdown, we see 2019 as a time for rational investors to take advantage of compelling investment opportunities in many oversold areas of the market such as financials, consumer discretionary, technology, and industrials. Although the investing landscape heading into 2019 may be frustrating to many fundamental investors, we are not changing our core investing discipline, which is designed to seek out quality companies running great businesses with excellent management teams that are trading at bargain prices. Moreover, we are not attempting to forecast or market time interest rates, currency fluctuations, or commodity prices. Instead, we believe this is an ideal time to examine the fundamentals of individual companies. Although not true for every company, we see the potential for solid earnings growthfor many of the companies in our portfolios in 2019. During the past year, the research team at Hodges Capital Management continued to rigorously gather and analyze firsthand information from a broad scope of publicly traded companies, which involved making more than 2,600 contacts across more than 1,000 management teams. Here are a few worthwhile observations. First, most management teams seem cautiously optimistic regarding the prospects for demand growth, pricing power, margin improvement and earnings in the year ahead. Second, balance sheets are generally carrying more debt than a couple of years ago, but seem manageable across most corporations.Lastly,we do not see the typical signals (such as a significant increase ininventoriesor overbuilding of manufacturing capacity) that would signal a coming recession in 2019.However, we do see some inflationary cost pressures in transportation and labor costs for certain industries, which are consistent with the latter stages of an economic cycle.Given the significant contraction of forward PE multiples during 4Q18 despite double digit earnings growth for the broader market, we would be surprised to see the P/E multiple for the average U.S. stock further contract in 2019. Furthermore, we see gains in 2019 being supported by earnings growth and stable multiples for most of the economically sensitive sectors of the market. While we are encouraged with the opportunities in the year ahead, we know 2019 will not be without its own unique challenges and we would not be surprised to see volatility persist throughout the year. In the midst of increased volatility, we have historically found bargains as we are rigorously look for investments in well-run businesses that control their own destiny by relying on ingenuity and well-calculated business decisions. Although the macro conditions impacting the market can seem overwhelming at times, we always fall back to the idea that the long-term performance of stock prices is determined by the future earnings and cash flows of each underlying business. In conclusion, we see 2019 as an ideal environment for active portfolio managers to carefully select individual stocks that can generate long-term value for shareholders. Despite outperforming its benchmark during much of 2018, the Hodges Small Cap Fund experienced a 24.84% decline in the final quarter of the 2018 to end the year down 16.26%, which compared to declines in the Russell 2000 Index of 20.20% and 11.01%, respectively. Disappointing relative performance in the most recent quarter reflected weakness in many of the Fund’s technology, consumer, financial and industrial stocks. After reflecting on the severity of the correction that occurred among small cap stocks, we believe extreme aversion to risk combined with above average tax loss selling in 4Q18 has resulted in many an oversold small cap stocks heading into 2019. Looking ahead we now view the risk reward for holding small cap stocks as balanced and believe this segment of the market provides an opportunity to generate above average relative risk adjusted returns in the year ahead. The Hodges Small Cap Fund remains well diversified across industrials, transportation, financial services, technology, and consumer-related names, which we believe can contribute to the Fund's long-term performance. The Fund has recently taken profits in several stocks that appeared fairly valued relative to their underlying fundamentals, and established several new positions that we view as having an attractive risk/reward profile. The total number of stocks held in the Fund at the end of the year was 50 compared to 47 at the beginning of this year. Top ten holdings at the end of the quarter represented 36.02% of the Fund's holdings and included Brunswick Corp. (BC), Century Communities Inc. (CCS), Commercial Metals Co. (CMC), Eagle Materials Inc. (EXP), Encore Wire (WIRE), Exact Sciences Corp. (EXAS), Legacy Texas Financial Group (LTXB), Ollies Bargain Outlet Holdings Inc. (OLLI), Texas Pacific Land Trust (TPL) and U.S. Concrete Inc. (USCR). The Hodges Fund's fourth quarter 2018 return amounted to a loss of 32.28% compared to a loss of 13.52% for the S&P 500 Index. Disappointing relative performance in the recent quarter was attributed to significant declines in some of the Fund’s largest positions. The leading detractors in the Fund during the recent quarter included Matador Resources Company (MTDR), Texas Pacific Land Trust (TPL), Comstock Resources (CRK), United States Steel Corporation (X), and At Home Group (HOME). These five positions experienced declines between 31-48% in the recent quarter as energy and consumer discretionary stocks were hit especially hard during the market’s recent correction. The Fund finished the full year down 34.18% in 2018. While we are making no excuses for the lagging performance in the final quarter of the year, the Hodges Fund remains focused on investments where we have the highest conviction. The number of positions held in the Fund at the end of the recent quarter was 41. During the final calendar quarter of 2018, we repositioned the portfolio to take advantage of what we view as oversold conditions in industrials, information technology, financial, as well as healthcare. Top ten holdings at the end of the quarter represented 50.90% of the Fund's holdings and included American Airlines Group (AAL), Boston Scientific Corp. (BSX), Commercial Metals Co. (CMC), Floor & Décor Holdings, Inc. (FND), At Home Group, Inc. (HOME), Smartsheet Inc. (SMAR), Triumph Bancorp Inc. (TBK), Texas Pacific Land Trust (TPL), U.S. Concrete Inc. (USCR), and United States Steel Corporation (X). The Hodges Small Intrinsic Value Fund experienced a loss of 25.62% in the December quarter of 2018 compared to a loss of 18.67% for its benchmark, the Russell 2000 Value Index. 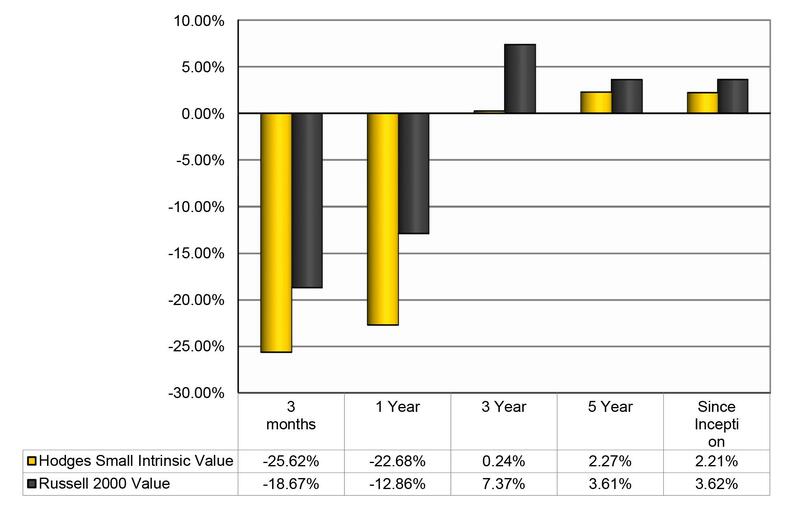 The full year return amounted to -22.68% compared to -12.86% return of the Russell 2000 Value. The Fund’s relative performance in 2018 was adversely impacted by the Fund’s consumer discretionary and financial stocks, which were among the sectors that sold off the most during the recent market correction. The top ten holdings at year end represented 63.45% of the Fund's holdings and included Blue Bird Corp. (BLBD), Cleveland Cliffs Inc. (CLF), Commercial Metals Company (CMC), Covenant Transportation Inc. (CVTI), Eagle Materials Inc. (EXP), Encore Wire Corp. (WIRE), Regis Corp. (RGS), Seaspine Holdings Corp. (SPNE), Tillys Inc. (TLYS) and Tower International Inc. (TOWR). 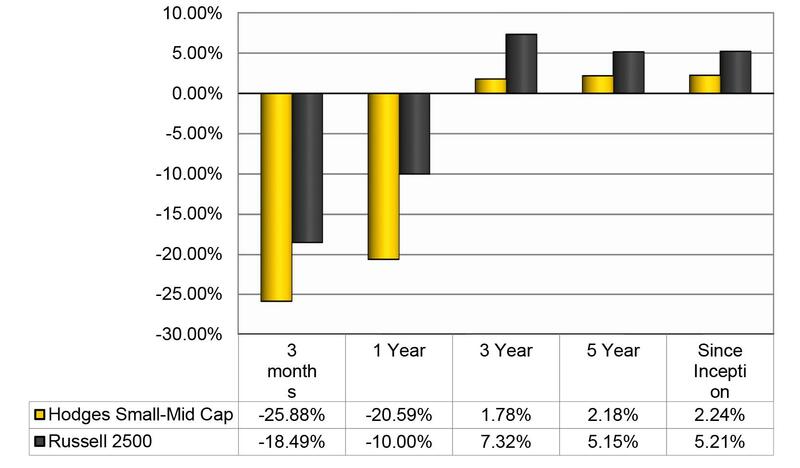 For the fourth quarter of 2018, the Hodges Small-Mid Cap Fund experienced a negative return of 25.88% compared to a decline of 18.49% for the Russell 2500. For the full year, the Fund experienced a loss of 20.59% compared to a loss of 10.00% for the Russell 2500. The Fund’s unfavorable relative performance in the final quarter of the year was attributed to an overweight exposure to consumer, home building, energy and industrial stocks. Two of the biggest detractors in the Fund during the final quarter of the year were WPX Energy (WPX) and Conn’s (CONN), which fell 37.5% and 40.45%, respectively.Top ten holdings at the end of the year represented 43.19% of the Fund's holdings and included Comerica Inc. (CMA), Conns Inc. (CONN), Cypress Semiconductor Corp. (CY), Fortinet Inc. (FTNT), Kansas City Southern (KSU), Live Nation Entertainment Inc. (LYV), Norwegian Cruise Line Holdings Ltd. (NCLH), Teladoc Health Inc. (TDOC), Triumph Bancorp Inc. (TBK) and WPX Energy Inc. (WPX). For the entire year ending December 31, 2018 the fund was down 26.35% compared to a loss of 4.38% for the S&P 500. Relative performance was especially disappointing in the final quarter of the year, in which the Fund experienced a loss of 24.84% in the December quarter compared to a loss of 13.52% for the S&P 500 Index over the same period. The Fund’s significant underperformance over the past twelve months has been largely attributed to several turnaround situations that demonstrated limited progress. The two largest detractors to the fund in the final quarter of the year were department store operator J.C. Penney (JCP) and Comstock Resources (CRK). Although this Fund stood out as our best performing fund in 2016 (up 70.51% compared to a return of 11.96% for the S&P 500), the Fund has significantly underperformed over the past two years. While timing a recovery in contrarian stocks can be tricky over short periods of time and rewarding over the long-term, this strategy has proven difficult to scale within the structure of an open ended mutual fund. As a result, we have recently taken actions as the advisor of the Hodges Pure Contrarian Fund to liquidate the Fund. Shareholders of this Fund have been notified as to their options to reinvest proceeds and the final redemptions will occur on February 25, 2019. The Hodges Blue Chip Equity Income Fund experienced a loss of 15.10% in the fourth quarter of 2018 compared to a loss of 13.82% for the Russell 1000 Index. For the year, the fund experienced a total return of -9.43% compared to a -4.78% return for the Russell 1000 Index. Negative performance relative to the benchmark in 2018 reflected weakness among several of the Fund’s high quality industrials, technology, and energy stocks. Although the fourth quarter of 2018 proved to be a brutal period for economically sensitive stocks, we see the current investing landscape as offering plenty of attractive high quality dividend-paying stocks with solid upside potential, as well as an opportunity for dividend income as a result corporate profits supporting the ability of companies to pay out dividends. The Blue Chip Equity Income Fund remains well diversified in companies that we believe can generate above average income and total returns on a risk adjusted basis.Top ten holdings at the end of the quarter represented 51.39% of the Fund's holdings and included Amazon.com Inc. (AMZN), Apple Inc. (AAPL), Boeing Co. (BA), Caterpillar Inc. (CAT), Home Depot Inc. (HD), Johnson & Johnson (JNJ), Microsoft Corp. (MSFT), Union Pacific Corp. (UNP), Visa Inc. (V) and Walt Disney Co. (DIS). In conclusion, we remain optimistic regarding the long-term investment opportunities surrounding the Hodges Mutual Funds. By offering distinct mutual fund strategies that cover most major segments of the domestic equity market, we have the opportunity to serve the diverse needs of most financial advisors and individual investors. Our entire investment team of portfolio managers, analysts, and traders are rigorously studying companies, meeting with management teams, observing trends, and attempting to navigate today's volatile financial markets. Feel free to contact us directly if we can address any specific questions. Mutual fund investing involves risk. Principal loss is possible. Investments in foreign securities involve greater volatility and political, economic and currency risks and differences in accounting methods. These risks are greater for investments in emerging markets. Options and future contracts have the risks of unlimited losses of the underlying holdings due to unanticipated market movements and failure to correctly predict the direction of securities prices, interest rates and currency exchange rates. These risks may be greater than risks associated with more traditional investments. Short sales of securities involve the risk that losses may exceed the original amount invested. Investments in debt securities typically decrease in value when interest rates rise. This risk is usually greater for longer term debt securities. Investments in small and mediumcapitalization companies involve additional risks such as limited liquidity and greater volatility. Funds that are non-diversified are more exposed to individual stock volatility than a diversified fund. Investments in companies that demonstrate special situations or turnarounds, meaning companies that have experienced significant business problems but are believed to have favorable prospects for recovery, involve greater risk.